Are your contents being copied by someone? Have you worried about your competitors who copy your contents without having your permission? Do you want to file DMCA takedown notices against the victims? Are you thinking to get read of people who copy your contents? If yes, then you are at right place. In this post, I am teaching how can you File a DMCA complaint against the victims. 1. What is DMCA Complaint? 2. 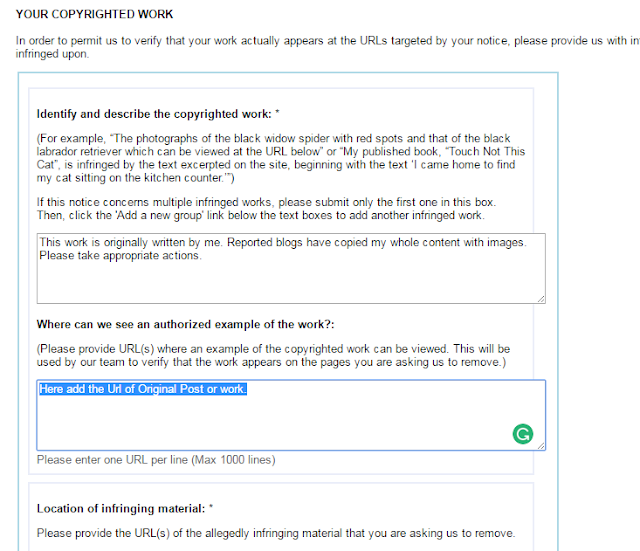 How can we File DMCA complaint or Takedown Notice with Google (For Bloggers)? 3. Step by Step Guide on How to Fill the DMCA complaint form. When content is removed from a website at the request of the owner of the content or the owner of the copyright of the content is called DMCA Takedown. This protection manifests itself in immunity from being sued for infringement, but they must take reasonable and swift action to remedy an infringement once they are notified. When can I make DMCA complaint? If the content is yours, or in the case of a photo or video the subject is you, can be sufficient enough to request a takedown. More likely, it is known that people cannot do that but people do it figuring they won’t get caught. 2. How can we File DMCA complaint or Takedown Notice with Google? Now, we will proceed on how to file DMCA complaint against the person or web owner who have copied our content and published on his/her own website. Generally, these are happening a lot in the blogosphere. This action has mostly performed by newbies. But copying of contents without the permission of the author is illegal and the victims can be filed by DMCA takedown notices. Even I have faced this issue many times. But I always filed a DMCA complaint against the Victim and my issues were solved. In future if it happens again with me then I will file the DMCA complaint. Now, I will teach you the exact steps that I follow while make DMCA takedown notices complaint to Google. Now You have to be ready with sufficient information to allow the copyright agent to identify where the infringing content is being made available without your permission. Generally, URL of the original content and the URL of duplicate content published by the victim are enough for making a DMCA complaint. Once you report these copied contents, Google will remove it from Web-index and your original ranking will be restored. If you are reporting content from Platform like Blogspot, those pages will be deleted by Google. It takes 2-7 days according to what I have noticed. But for self-hosted blogs or websites, you can only report to remove it from Google web search but to delete that blog completely, you need to send a DMCA notice to web hosting providers of that site. In this post, we will only learn to remove such content from Google Search. The first step in filing DMCA complaint is to fill the DMCA complaint form. For this, you have to find the platform that victim used to copy your contents. Once you identify the next step is to fill the complaint form. For your ease I am listing the direct form links that will land you direct on the form. If the Victim is running their site on Blogger or blogspot then you have to fill this form. If the Victim have copied and pasted your content on Wordpress blogs then you can use the belo form. If the victim is from Linkedin blogs, you the below link. Use this this to file a complaint. If you are not sure about the platform using your victim then simply fill the form using below given link. Link to fill the complaint form. After opening the form, add the details of Original wok and infringment content. Here I have created a video that will help you understanding in easy way. Before submitting, recheck your request. The action against victim is taken within 2-7 days. If the Copier of your contents is using Google Adsense on their site then you can use below link to make complaint. Honestly, I write this post to make aware my fellow bloggers to protect their work. I also want to get rid of those people who do not respect and value the real authors. Mostly, after knowing that someone has copied our contents still bloggers do not take any action against the victim because they think it woud be tough one. But no guys, it's a bit easier. You can do it in minutes. You have to just fill a form. Also, if that Victim is making or copying our contents again and again then no need to worry just submit the complaints 2-3 times and the whole site of Victim might be blocked or removed by the Google or the hosting providers. Actually, the complaint form we submit, we are not asking the victim but we are making complaint to the hosting provider of that victim's blog. And in this type of cases hosting providers take it seriously and remove the contents without making any delay. So, guy after reading this post now we have the power to fight with the victims and definitely we will win. A message to my those friends who are in the habbit of copying contents, stop it now or your whole site will be deleted. Guys, if you really want to stop this activity of copying our contents, share this post as many as you can so mass of bloggers can be made known to this fact, power and tool to fight with those victims and defeat them badly. I am here to help you personally to get rid of those people who are copying your original written contents. If you face any problem in above steps, let me know your issues and I will provide you better solutions. Message: I hope that you have enjoyed 'How to File DMCA Copyright Complaint - Remove Copied Contents in 2 Simple Steps' article on Tips2secure. However, if you want me to deliver more items, then please share my post. You can use Social Sharing Widget provided at the end of every post. After all, Sharing is Caring! Hi, There is no social share buttons? Social sharing buttons have been added, now you can share this post on your social media profiles. Nice Article thanks for sharing. I strongly recommend this article to those bloggers who felt or feeling something like me. Not sure, but you may give a try. Here in 2nd Point : WordPress bloggers copying your content, if the victim uses WordPress ? what does it mean blog.wordpress.com or self hosted blog ?